I must admit that I am sitting as I write this ( cue the horror music). Since sitting has gotten such a bad rap these past few weeks I felt it was important to look past the looming headlines and see from a more technical and physiological standpoint why chronic sitting is bad for our bodies. Let’s look at the image below and break it down to understand what is going on when we sit. 1. 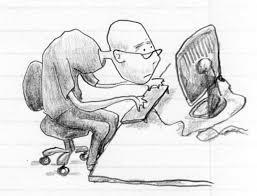 Forward neck: Leaning your neck forward (this is also common while we are texting or surfing the internet on our phones) gets your cervical vertebrae out of alignment causing neck stiffness and pain. 2. Rounded spine: This is more than just temporary bad posture. Sitting like this for long periods compresses your disks and hinders blood flow. Over time collagen can harden in the tendons and ligaments and actually start to make this your permanent posture. 3. Inactive core muscles: There is no real need for you core muscles to fire when you are sitting. In this position your abs relax and the muscles in your low back tighten creating lordosis or swayback – an unnatural and exaggerated curve in your low back and a protruding abdomen. 4. Tight hips and inactive glutes: The constant hip flexion in a seated position will make your hip flexors very tight, and like your core the glutes have no real need to activate- you are sitting on them after all :). 5. Low back pressure: Think about the pressure your upper body is putting on your lower back as you sit. Everything compressed and adding force to your lumbar region. It’s no wonder 80% of Americans complain of low back pain at some point. Aside from the mechanical problems our bodies face while sitting too much there are a couple of more physical reactions I find more disturbing. 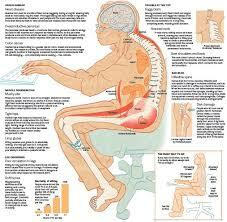 Prolonged sitting reduces the enzyme (lipoprotein lipase) in our bodies. It’s job is to remove fat from our bloodstream. The less we move the less this enzyme is working. 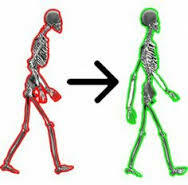 Along with that a gene in the body that regulates inflammation and blood clotting is turned off when we are motionless. Now that we know why prolonged sitting is bad for us, what can we do to help ourselves in this world of computers and cubicles? First, notice I said PROLONGED sitting. It is ok to sit once in awhile – I am still sitting actually.However I do take breaks and stand and move. If you stood in the same position all day that wouldn’t be great either. Your body needs to move. These moves do not need to be an official workout – just a way to keep your muscles active and awake! Also make sure your desk chair is ergonomic and does not put you in a slumped and unsupported position. Try to move around in your chair as you sit as well. Moving every 30 min or so will not only keep your metabolism humming and give you better posture, it will make you think more clearly. It is easy to get into “brain fog” after sitting too long. Soon moving and fidgeting will become a habit, and you will wonder how you ever sat there like a statue for hours.